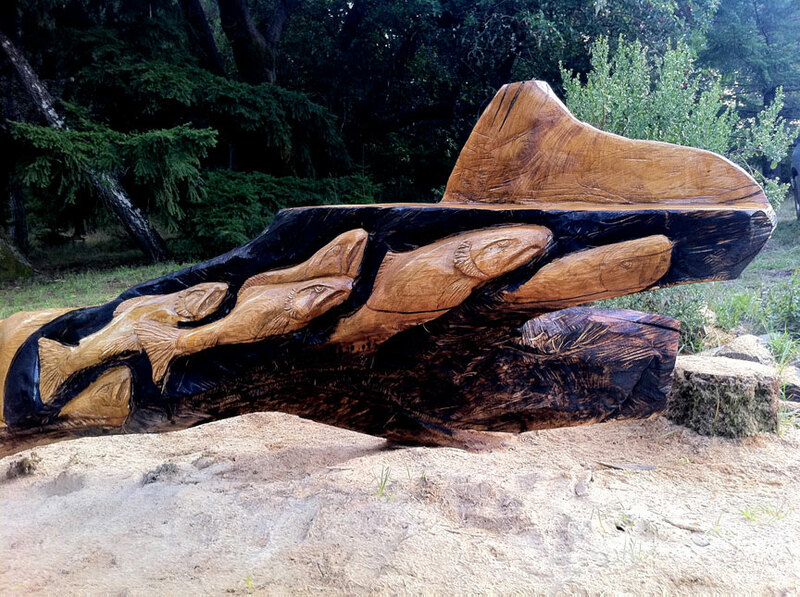 “I like to go fishing—not with a pole, but artistically, with a chainsaw and some wood,” said Jessie Groeschen, a California chainsaw artist and the author of The Art of Chainsaw Carving published by Fox Chapel Publishing. Jessie carved Grizzly Bear and Salmon Spirit, 3′ by 7′, into reclaimed old growth redwood. 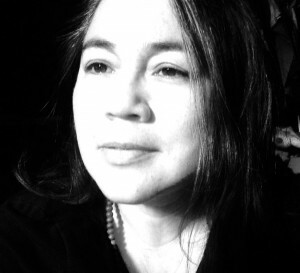 Jessie was born by the sea in a small fishing village in the Philippines. Her father, an American, was a fisherman like his father before him. “My mother was a fiber artist who used to tell the best stories—tales of mermaids and fish,” she remembered. 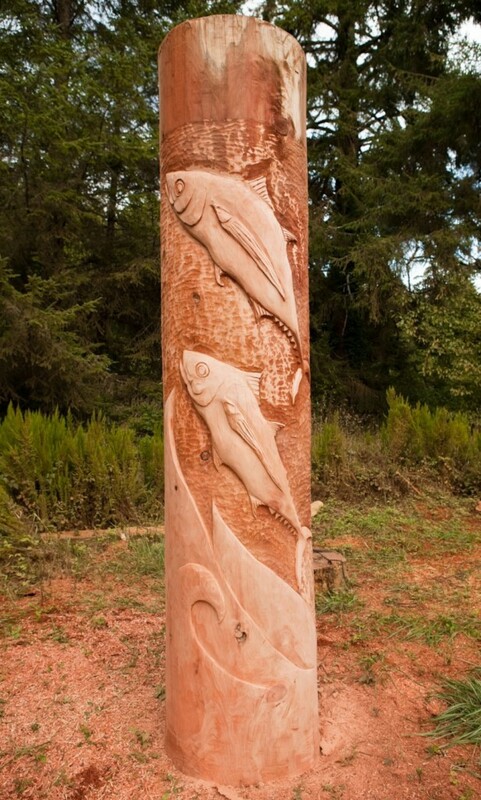 Later the family relocated to United States and lived in several locations from the desert of Southern California to Whidbey Island, Wash. Jessie received a bachelor’s degree in art, sculpture, and art history and spent a decade developing her unique techniques for capturing fish in chainsaw carvings. Salmon Creek is a white oak bench and table that Jessie carved where it fell one snowy winter day. This albacore column, 2′ by 11′, carved in old-growth redwood was one of four columns that Jessie made for use as an entryway at a business. To accomplish her work she uses 10 gas chainsaws in different sizes with different bars. “I like to call them my chisels,” she said with a chuckle. “I would like to incorporate more traditional and standard woodcarving tools in with my repertoire of tools, but mostly it is just the chainsaw because chainsaws have evolved into great woodcarving tools. They have become super light, with a really short bar that can get the job done quickly—plus, there is just something about the immediate results of carving with a chainsaw.” For relief carvings she prefers a small chainsaw with a carving bar because it is easier to control. Visit Jessie online at http://www.groeschen.com. 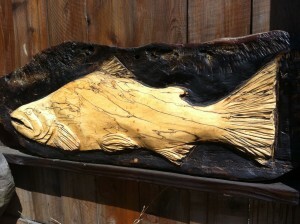 King Salmon was carved in spalted maple and measures 3 1/2″ by 20″. 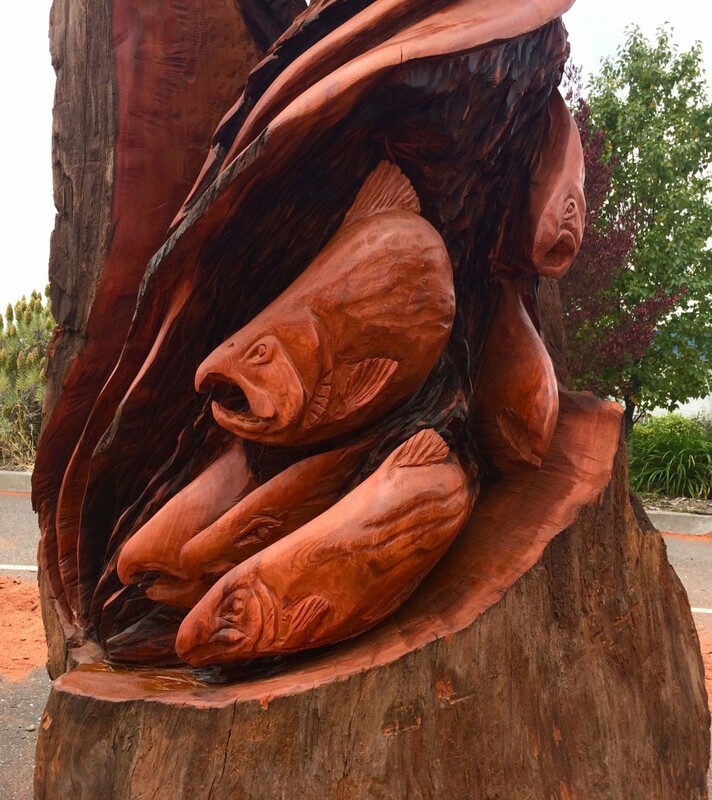 Want to learn more about chainsaw carving? Consider attending the Ridgway Rendezvous in northwestern Pennsylvania. 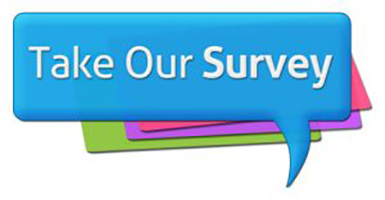 The event takes place March 5-12, 2016. For more information, visit http://chainsawrendezvous.org/.